The OPTIONAL ClimateLineAir™ Heated Tube can be added to the therapy system to optimize humidification. Select the “Auto” function on the AirCurve 10 VAuto to allow the Climate Control system to set for the optimum humidification with minimal rainout condensation. The system considers the temperature of the room air to deliver the optimum level of humidification. Please Note: The ClimateLineAir™ tube is 78 inches in length. EPR™: When the AirCurve™ 10 VAuto is set in CPAP Mode, the machine offers Expiratory Pressure Relief (EPR™) to help therapy feel more natural. ResMed’s EPR™ feature adjusts the amount of pressure delivered during exhalation and inhalation. The feature can be turned off, or set to Level 1, Level 2, or Level 3. Level 1 is the smallest change between inhalation and exhalation, while Level 3 is the largest change in pressures. Easy-Breathe: In S Mode, the machine uses Easy-Breathe technology to mimic the user’s breathing pattern to help create a more familiar sleep experience. Automatic Adjustments: When placed in Auto Mode only, the machine is designed to automatically adapt the pressure as needed. 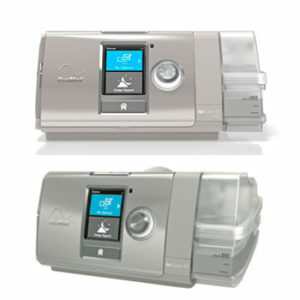 Ramp: In CPAP Mode, this feature gradually increases the pressure in increments before reaching the prescribed pressure. This is intended to help the user acclimate to the pressure and fall asleep with greater ease. In VAuto, S, ST and T Modes, the expiratory pressure increases from the starting EPAP to the prescribed pressure. The chamber should be taken apart and hand washed weekly using warm water and a mild detergent. It should be rinsed well and allowed to air dry out of direct sunlight before reassembling. The chamber SHOULD NOT be washed in a dishwasher or washing machine. The hose should be washed in the same manner and allowed to completely dry out of direct sunlight before reattaching to the machine and mask.